Wow, did I deserve these guys? This is what I get to look at when I go to work. All of these pics are click-able to enlarge. We worked a school for 90 minutes this morning that was close to a half a mile long and 200 yards wide. 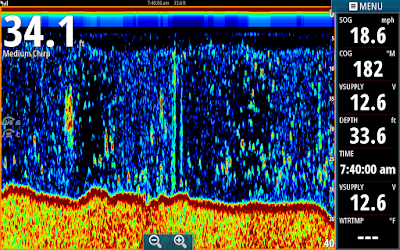 This is a shot I took off of the Lowrance HDS 12. 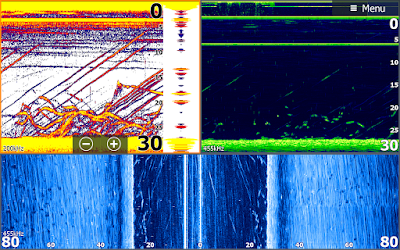 Stripers are laced from 20 to 30 foot deep. Here is another shot later in the morning working the same school. Notice the shadows of the Stripers on side scan. 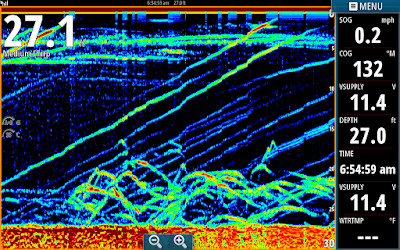 Another Lowrance shot. This is a shot from my Simrad after we had boated a bunch of Stripers. The screen had looked much better but this was the first chance I had to pop the picture. After working the school for 45 minutes I wanted to see how large it was so I got up on plane and while I was running I took this shot. 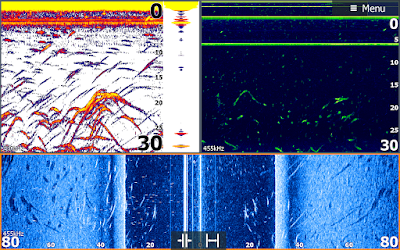 I had run about 400 yards and everywhere I looked was solid Stripers. 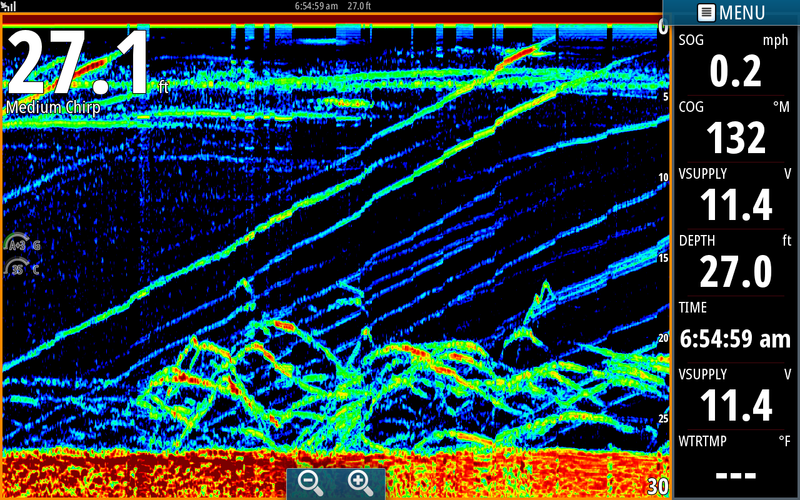 I am running 18 mph here and all of the yellow-red splotches below 20 feet are Stripers. 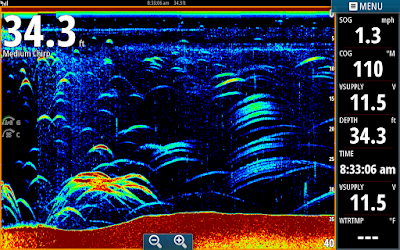 When I slow down the all the Stripers turn into arches on the screen. This is a cool pic I popped just after I got off of a large school of Stripers. We had just boated a bunch when I looked down at the screen and took this shot. If you enlarge this pic the screen almost looks like a Star Wars or Asteroid game at an arcade. All of the Simrad shots were taken running Chirp. Navico is the Bomb! 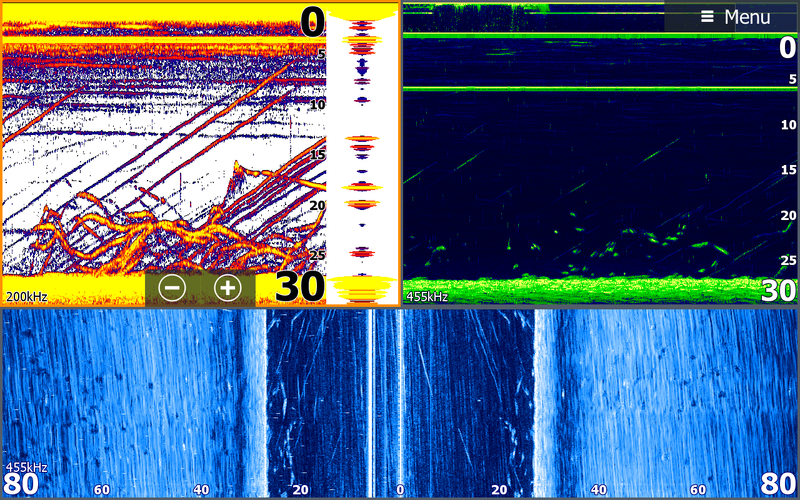 If Navico keeps improving their technology people may not want to go fishing anymore, they may be satisfied just looking at screen shots and dreaming of catching fish. That reminds me....... all I dream of is Fishing!